Mark Mc Cormack is the Founder of Create the Great in You Ltd. He is married to Lisa Mc Cormack and together have three beautiful Children. Callum, Matthew & Millie. Mark has worked in sales throughout his life and in the construction industry. The economic downturn in 2010 left many families without work. It was at this point where Mark began to reflect on his own journey in life. He decided to return to education in 2010 starting with an ECDL course at Ardee Business Park and afterwards he was accepted onto a Fetac 5 course at O’ Fiaich College in Applied Psychology in Social Care Work. Mark progressed onto a Level 8 BA (Hons) Degree in Social Care Work in Dundalk Institute of Technology. Graduating in 2015 he completed a paper titled: Mentoring Males: A Positive Approach to Improving Young Males Success in Education & Life. Mark received a 2:1 BA (Hons) Degree in Social Care Work. Dundalk Institute of Technology Awarded Mark a Presidents Prize for his Contribution to College & the Community we serve. 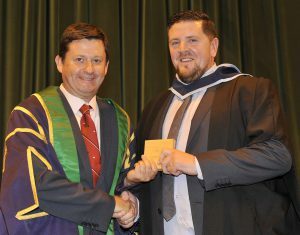 Mark McCormack, receives his award from DkIT President, Denis Cummins at the Conferring of Awards in DkIT. Since Graduating Mark has co-authored a paper alongside Dr Bernadette Brereton in 2016 which was represented in Milan at the European Sociological Education Conference. Create the Great in You Ltd provide a series of workshops and or a tailor made programme designed to meet the needs of the students in within a classroom or club environments. Our team of mentors introduce the mentees to “3 C Thinking”. “3 C Thinking” is where the group begin a journey of self-development and critical thinking. Individuals are introduced to Communication, Collaboration and Creativity. The group will learn new skills both practical and interpersonal which can be applied to daily life at home/school or within the community we serve. The aim of the programme is to better equip participants with the skills which they can apply to their daily life within the community. Mark’s drive and passion comes from his own experience. He felt a little different than others in his community and he believes a mentor may have made a huge difference in his life as an adolescent growing up. Marks research in 2015 highlighted some of the societal problems families are experiencing in Ireland now from family break ups, early school leavers and the increasing level of suicide which is currently at a 5:1 ratio of male to female. The research focused on communication and the increasing level of young people who are using technology which is eroding our social fabric.